Самолет Blackburn RB.2 Sydney разработан согласно спецификации R.5/27 Министерства авиации на основе RB.1 Iris. Прототип этой летающей лодки - моноплана с тремя моторами Rolls-Royce Falcon X мощностью по 510 л. с. - был заказан в июне 1927 года, но вскоре ДальшеMore>>> фирма получила указание заменить эти двигатели на три Rolls-Royce F.XIIA мощностью по 525 л. с. В окончательном варианте установили три мотора F. XIIMS. RB.2 Sydney - летающая лодка цельнометаллической конструкции, корпус с закрытой кабиной выполнен по двухреданной схеме. Крыло установлено на мощном стальном пилоне с дюралюминиевой обшивкой над корпусом, дополнительную прочность крепления крыла к корпусу обеспечивают четыре подкоса, по два с каждого борта. Хвостовое оперение состоит из стабилизатора, усиленного подкосами, с рулями высоты и трех килей с рулями направления. Мотогондолы с двигателями смонтированы на центроплане крыла. Первый полет Sydney выполнил 18 июля 1930 года. В ходе испытаний был выявлен ряд проблем, способных осложнить эксплуатацию самолета, преодолеть которые не удалось. Ни Sydney, ни его вариант RB.2A с моторами Kestrel MS в серийное производство не пошел. Единственная построенная летающая лодка в 1934 году потерпела аварию. Летающая лодка Nile осталась незавершенной. Самолет заказала авиакомпания "Cobham-Blackburn Air Lines" для авиалинии Александрия - Кейптаун, но британское правительство приняло решение о передаче всех авиапочтовых маршрутов в ведение авиакомпании "Imperial Airways". В 1935 году корпус летающей лодки Nile подвергли статическим испытаниям на прочность до полного разрушения. План постройки варианта CB.2F для "Canadian Airways" реализован не был. Силовая установка: три V-образных мотора Rolls-Royce F. XIIMS мощностью no 525 л. с. THE BLACKBURN AEROPLANE CO., LTD. 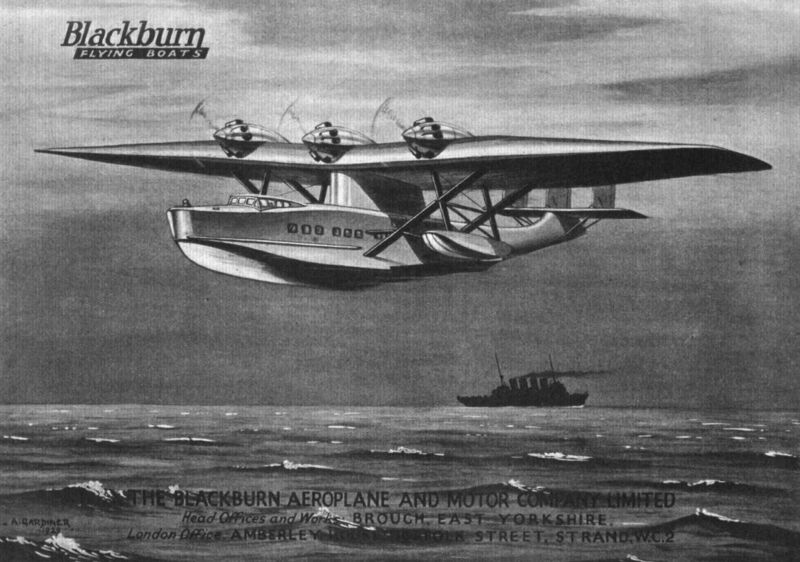 The Blackburn Monoplane Flying Boat, represented by a scale model, is fitted with three Bristol "Jupiter IX" engines and has passenger accommodation for sixteen. The thick monoplane wing is mounted, on a sort of conning tower, high over the long cabin-hull and well back from the nose, and the three "Jupiters" are mounted on the leading edge 13 1/2 ft. apart. From the bottom of the keel to the top of the engines is a distance of 19 ft. 2 1/2 in., and 16 ft. 6 in. from the low water line on the boat to the top of the engines. There can thus be little danger of spray rising to the propellers. A float is fitted on each side of the hull about 14 ft. of the centre line, and braced to the wing. The wing section rises to its thickest just beyond each side of the outer engines, then tapers to the wing tips. It is braced with sloping struts from the hull. There is a low raised top to the pilot's cabin in the nose and windows for each passenger along each side of the hull. The tail unit is highly mounted over the water line. Rudders are triplicated and narrow. Span is 98 ft.; overall length, 65 ft. 4 in. 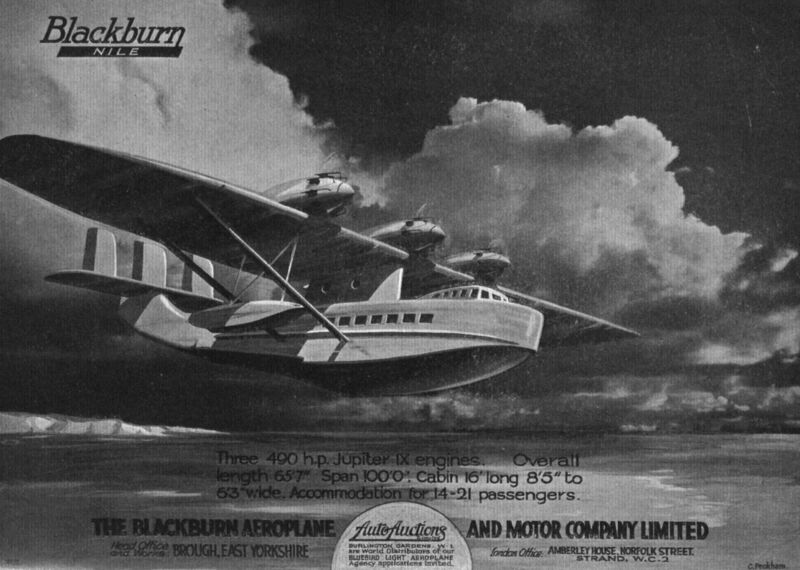 BLACKBURN AEROPLANE & MOTOR CO., LTD. IN addition to the machines exhibited on their own stand, the Blackburn Aeroplane and Motor Co. will have on view two "Bluebirds." These, however, will be exhibited on the stand of Auto Auctions, Ltd., who have been appointed sole world concessionnaires for this type of light 'plane. The descriptions of the "Bluebirds" will, however, be found at the end of the notes dealing with the aircraft shown on the Blackburn stand, and readers are reminded that prospective purchasers should apply to Auto Auctions, Ltd., for more detailed information than can be given in the limited space we have available. On the Blackburn stand itself four complete machines will be exhibited, or rather three complete machines and one large flying-boat hull, for the wings of which there is not sufficient room at Olympia. The four machines are: The hull of the "Nile" commercial flying-boat, a "Ripon II" torpedo, bomber or reconnaissance biplane, the "Lincock" light single-seater fighter, and the "Nautilus" reconnaissance deck-landing fighter. The Blackburn "Nile" will, in some ways, be one of the most interesting exhibits in Olympia. To begin with, it is a very large all-metal flying boat, which fact in itself entitles it to a close inspection. Then it is the first British commercial all-metal monoplane flying-boat to be constructed, the monoplane wing arrangement not hitherto having been employed on any British flying-boat designed for commercial work. The absence of a superstructure will partly prevent visitors from obtaining an exact idea of what will be the appearance of the machine when finished, but the general arrangement drawings which we publish should help materially in showing the machine as a whole. 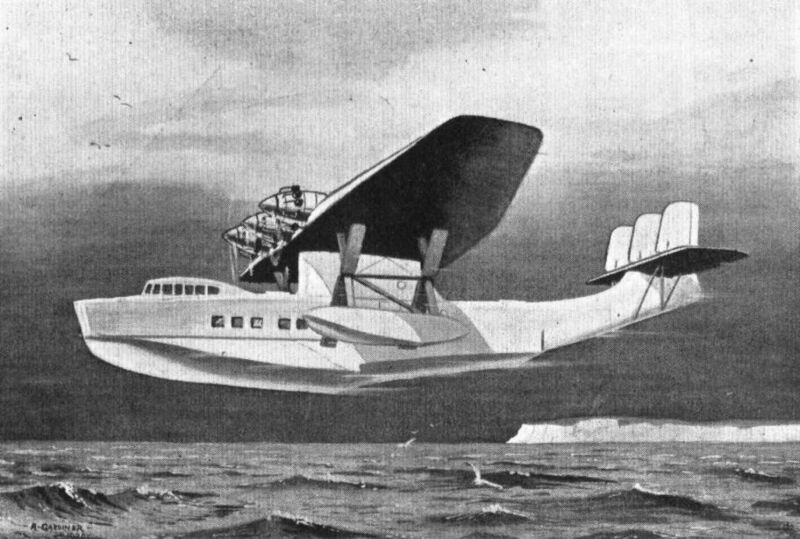 The "Nile" is a three-engined monoplane commercial flying-boat of all-metal construction, designed for long-distance over-sea passenger or cargo transport. Accommodation is provided for a crew of three, 14 passengers, and a load of luggage and mails. The boat hull is constructed of Duralumin, with stainless steel fittings. The lines of the hull follow fairly closely those of the well-known Blackburn "Iris II," which has proved so successful over a considerable period of service. In the bows of the hull is an alternative station for the navigator, from which moorings can be picked up, and handling on the water supervised generally. Between this forward cockpit and the main control cockpit is an interior station for the navigator, with stowage for charts, navigation instruments, &c, and a table and chair. The control cockpit, which is situated in front of the wing, is an enclosed cabin fitted with two seats, dual controls, flying instruments, etc. Being placed in front of the wing, the view from the pilots' cabin is very good. A passenger saloon with seating accommodation for 14 occupants follows aft of the cockpit. The armchairs in the saloon have leather upholstery, and are arranged generally in groups of 4, two of which face forward and two aft, with a table between. Airspeed indicator, altimeter and clock are provided inside the saloon for the convenience of the passengers. Aft of the saloon is a lavatory, and the steward's pantry arranged for carrying food supplies, crockery and cooking stoves. Access to the saloon is by way of a hatchway at the rear, which is provided with accommodation ladders, one over the side and another leading into the interior. Behind the saloon hatchway is the compartment for luggage and mails. 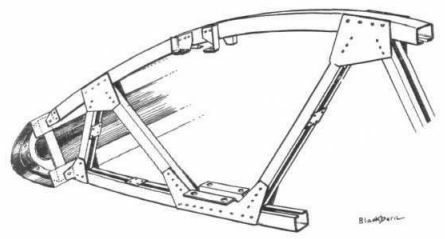 The monoplane wing is carried high above the water line to avoid risk of damage by high seas, and interference with the working of the engines. The wing is supported above the hull, at the centre by a faired structure of steel tubes, and at the extremities of the centre-section by sloping streamline steel tube struts from the hull. Two outboard floats maintain lateral stability on the water. These floats are placed relatively close to the main hull, below the wing bracing strut attachments. 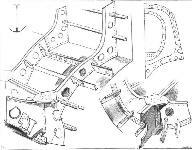 Structurally the monoplane wing, which consists of a centre-section and two end pieces, is built up of Duralumin box spars and Duralumin ribs. The wing tapers both in plan and elevation. The power plant consists of three Bristol "Jupiter" engines carried in nacelles faired into the leading edge of the wing. The main petrol tanks are carried in the fairing between the hull and wing, and the petrol system includes pumps and distributor controls to three small service tanks, one in each engine nacelle. No petrol is carried inside the hull. 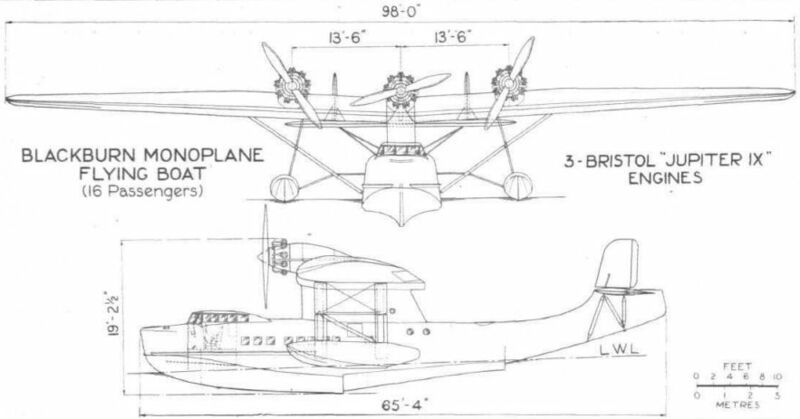 The main overall dimensions of the Blackburn "Nile" flying-boat are: Length o.a., 65 ft. 7 in. ; wing span, 100 ft.; wing area, 1,500 sq. ft.; maximum chord, 17 ft.; minimum chord, 9 ft. The maximum thickness of the wing section is 2 ft. 4 1/2 in. Detailed weight figures are not available, but the estimated gross weight of the "Nile" is 20,700 lbs., and the total load carried is 5,950 lbs. As the machine has not yet been completed, the following performance figures are necessarily estimated: Full speed at sea level, 107 knots; cruising speed, 87 knots; landing speed, 52 knots. The initial rate of climb is 700 ft. per min. ; and the service ceiling, 14,000 ft. The power loading is 14-1 lbs. per h.p., and the wing loading 13-8 lbs. per sq. ft. According to the proportion of pay load and fuel carried, the tankage is 340 gallons to 603 gallons, corresponding to durations of 4 1/2 and 8 hours respectively. THE Blackburn "Sydney," the largest military monoplane flying-boat in this country, is designed to carry out the same duties as the well-known "Iris" type, namely, reconnaissance and coastal patrol, either independently or in co-operation with seacraft, and is arranged to carry a similar crew and military load. Constructed entirely of metal, with the exception of fabric covering on the wing and tail unit, the "Sydney" is a high wing semi-cantilever monoplane flying-boat, of remarkably attractive appearance. The hull, like that of the "Iris," has a deep fore-front and is well flared to keep down spray, and the same graceful lines are kept. In the "Sydney," however, the sides of the hull above the water line are nearly perpendicular, whereas those of the "Iris" slope toward the deck at a noticeable angle; this means that the interior is much more roomy. From the second step the lines sweep upwards to the stern in which a tail defence machine gun station is provided behind the tail 'plane. The wing is supported above the hull at the centre by a steel tubular structure built up on the hull and faired to form a streamline nacelle, and at the extremities of the centre ‘plane by two pairs of sloping struts from the hull. In appearance, the wing closely resembles the wings of a gull, the centre 'plane having a dihedral angle and the outer 'planes tapering to the tips in both plan and elevation. 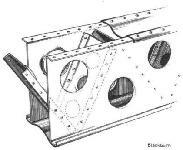 The wing floats are set comparatively close to the hull and are supported by two pairs of struts from the centre 'plane which bisect the wing bracing struts. 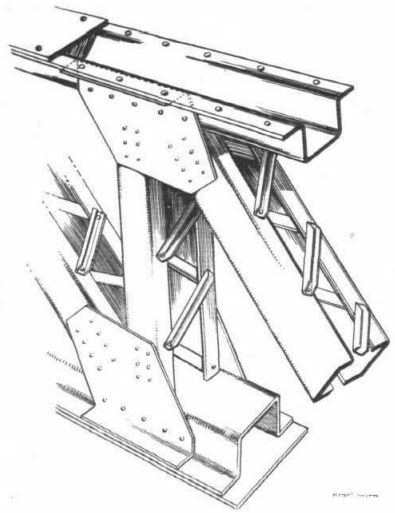 The tail 'plane is also a monoplane braced similarly by two pairs of struts from the hull and fitted with trimming and controlling elevators. No fins are fitted, and the three rudders, which are unbraced externally, incorporate servo control which can be engaged or disengaged as required. The three Rolls-Royce F.XII M.S. engines (525 h.p. each) are carried in nacelles faired into the top of the leading edge of the wing. Each nacelle is fitted with a water tank and radiator with shutters and an oil tank and cooler. The main petrol tanks are carried in the faired portion between the hull, and the engines are supplied by engine pumps through distributor control. Accommodation is provided for a normal crew of five, comprising pilot, second pilot-navigator, wireless operator, engineer and gunner. The bow cockpit is arranged for machine-gun operation, bombing, and towing and mooring operations which are carried out by the navigator. Communicating with the bow cockpit is the control cabin which is completely enclosed. Two comfortably-upholstered adjustable seats are mounted side by side on a higher level than the central gangway and dual flying and engine controls are fitted. The cabin top, which permits an excellent view in all directions, is fitted with sliding side windows and sliding panels in the roof through which a good upward and rearward outlook can be obtained. Dividing the control cabin from the remaining interior stations is a water-tight bulkhead with communication through a door in the centre. Behind this bulkhead on the port side is the navigator's station and on the starboard side the wireless station. The navigator is provided with a chart table and revolving chair, and stowage for navigation instruments, etc. Mounted on the bulkhead on the port side are a compass bracket, a mirror, and, in the centre at the top, a clock. On the starboard side, the wireless apparatus is carried on a panel against the bulkhead and a similar table and chair are fitted. 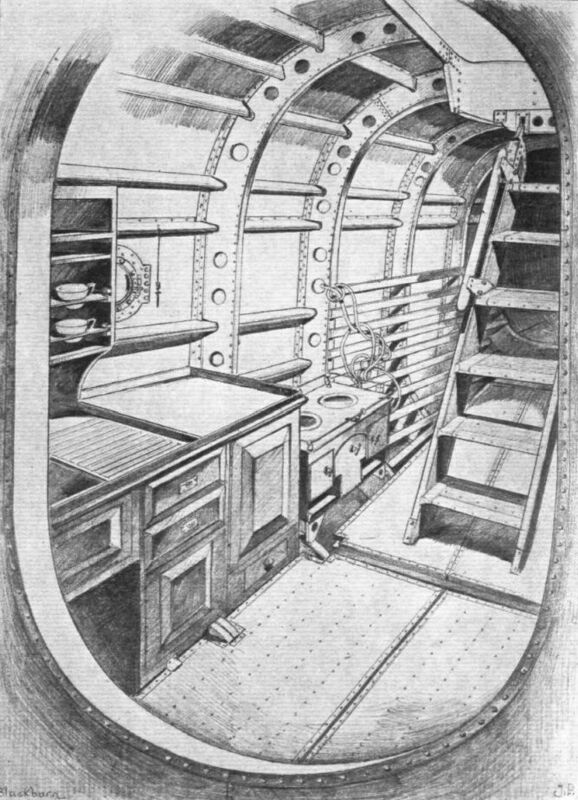 Aft of the wireless station is a settee berth, the back of which hinges upwards to form an upper berth; locker space for clothes, etc., is provided below the bottom berth. On the port side are three mahogany cupboards for canteen equipment, crockery, etc. On the front of the rear main frame of this compartment, on the starboard side, an engine instrument panel with radiator shutter controls is mounted; this is the engineer's station and is fitted with two seats with locker space underneath. The next station aft forms the men's sleeping quarters and is equipped with three folding bunks, two on the port side and one on the starboard side. Further aft, an enclosed lavatory with door is provided on the port side. Behind this is a cooking stove with ice chest beneath, and on the starboard side are fresh water and paraffin storage tanks. At the rear of this compartment is the rear machine-gun cockpit below which is the gunner's platform; this platform has a hinged top which gives access to locker space beneath. A separate portion of this platform also hinges upwards to allow communication with the after part of the hull and tail defence station. While complete data regarding the "Sydney" may not be given, it may be stated that fully loaded its gross weight is nearly 10 tons. Its military load is very similar to that of the "Iris," and in size it closely resembles the "Nile" merchant flying-boat which was laid down at the same time as the "Sydney" but has been delayed owing to the urgency of its military counterpart. In respect of performance, the "Sydney" is expected to be faster than both the "Iris" and "Nile," and to have a top speed of over 120 m.p.h. Летающая лодка Sydney, выполнившая первый полет в серебристой окраске, получила в ноябре 1930 года темно-серую окраску. The Blackburn "Sydney" (3 Rolls-Royce "Kestrel") monoplane Flying Boat. READY FOR LAUNCHING: The Blackburn "Sydney" on the slipway at Brough. 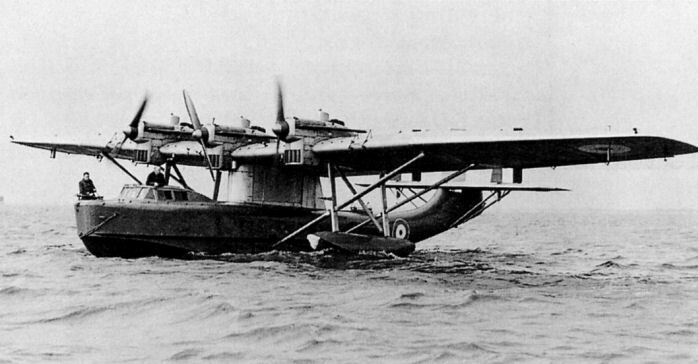 Fitted with three Rolls-Royce "F" type engines, this machine is an Open Sea Reconnaissance flying boat and the first monoplane of this type to be produced in England. Engineers can get to the engines from the hull through the streamline structure which contains the petrol tanks. A description of this machine was published in our issue of September 5, 1930. THE BLACKBURN "SYDNEY": This machine is generally similar to, but a Service version of the "Nile," the hull of which was exhibited at Olympia last year. The Blackburn "Sydney." 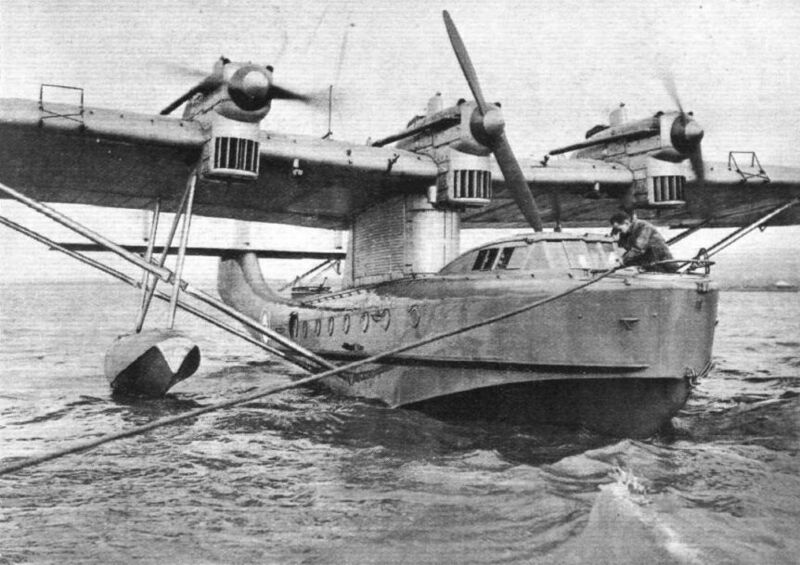 The largest military monoplane flying-boat. She has three Rolls-Royce F. XII M.S. engines, and has been designed for reconnaissance and coastal patrol work, carrying a normal crew of five - pilot, pilot-navigator, wireless operator, engineer and gunner. 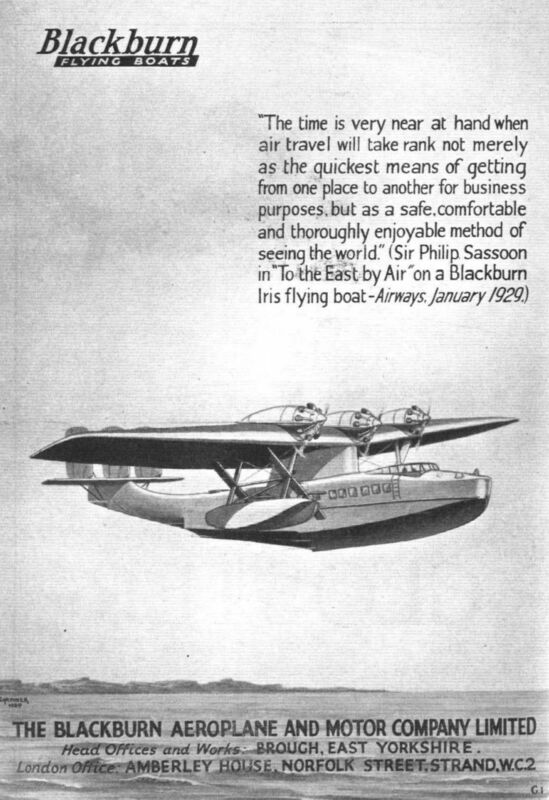 THE LARGEST COMMERCIAL FLYING-BOAT: The hull of the Blackburn Nile. The Blackburn Stand: In the foreground the "Lincock." To the right of that a "Bluebird" in skeleton, and on the right the hull of | the "Nile" flying-boat. A PEEP into the immediate future is afforded by the interior of the Blackburn "Nile" flying-boat hull, in which, in addition to the usual seating accommodation for passengers, there is a canteen with stove and complete equipment for serving meals while the machine is in flight. 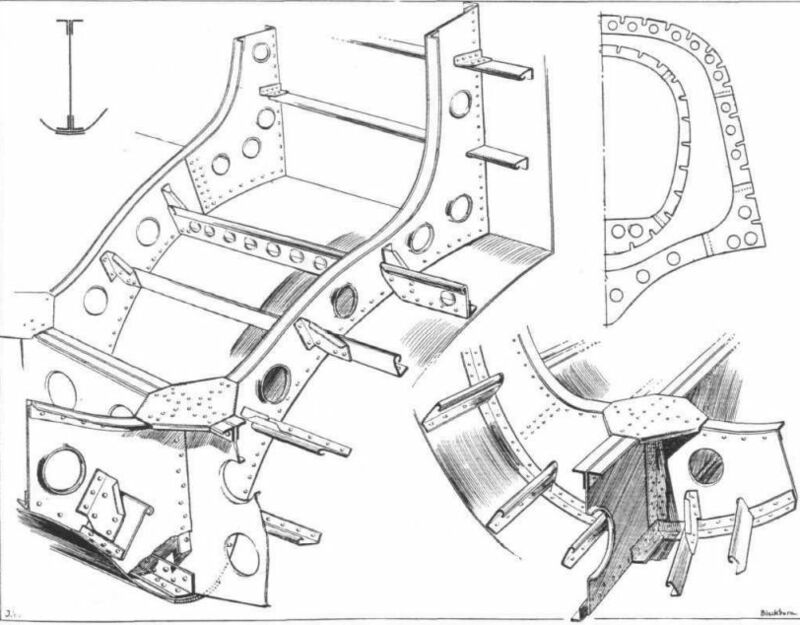 Construction of centre-section rib and leading edge on Blackburn "Nile." 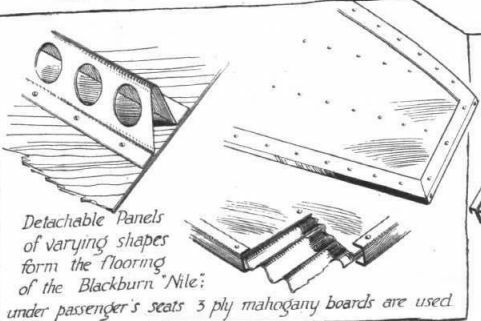 Details of the main spar (Duralumin) of the Blackburn "Nile" flying-boat. A main spar (Duralumin) in the tail plane of the Blackburn "Nile."